I win. I normally believe that my children’s biggest obstacle in life is their mother. It is pretty much a guessing game on my part and adaptation on their part. I have crackers and cheese easily accessible so that they can snack any time they want. Same with apples and occasionally fruit snacks. James and Katherine will even feed Seth. Today James told me he could babysit if we paid him because he knows how to make cereal and PBJ. 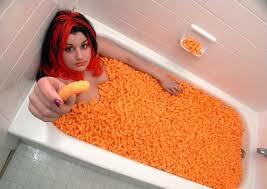 so cheetos for someone who normally rates sub-par as a mom.